I have developed a new blog at SwarmUSA.com called the Swarm Blog. I posted an article by Damon Vrabel who has agreed to be a regular contributor to the blog on the site along with me and Bill Still. Please bookmark that page it should be great. The Swarm grew by about 30 more members today, nearly a 25% increase, not bad for opening day. It's a snowball, and it's just started. If you have a site or any type of following and would like to be included on that page, please let me know. Thanks to all who supported the Swarm today, same drill for tomorrow and then we'll move on to other targets on Monday. Enjoy you weekend! Don’t forget that Opening Swarms are ongoing – please help to Bring the Sting! Please visit Swarm Central to help with our Grand Opening Swarm. It's simple and it's going to be effective over time. Please bookmark that page and visit every day to keep the momentum going towards Freedom's Vision! If you have a Blog or other web site, your country will thank you later and we'll thank you now for placing the following widget so that others can find and participate in the Swarms that begin tomorrow! Thank you! We're Doing Something About it!Come Join the Swarm! Beginning Saturday, March 6th, SwarmUSA.com will commence Swarms in support of Freedom’s Vision. 1. End debt backed money at the federal level, returning the money power to the people via their elected representatives in Congress as the U.S. Constitution dictates. 2. Clear out excessive debt and derivatives from the entire financial system, thus repairing balance sheets and producing workable debt-to-income ratios. 3. Ensure that the quantity of money remains under control in the long term. Swarm Politics is a new and powerful political tool to leverage the power of the people. The benefits are many for America’s future and wellbeing. The goal of the Grand Opening Swarm is to garner support for Freedom’s Vision and to grow the size of the Swarm. We are looking to build a coalition with other individuals and groups who support this most important cause. Please contact us so that we may build mutual support, we ask all Swarm members to support those who support Freedom’s Vision and the Swarm. Ensuring freedom, prosperity, and a sustainable future for America is certainly a worthy goal. In order to incentivize new Swarm members, the American Party PAC is offering the first 25 Swarm members who bring us FIVE additional Swarm registrations a copy of Bill Still’s latest award winning film The Secret of Oz. Recent winner of “Best Documentary of 2009” and many other awards, The Secret of Oz entertains you while explaining the history behind our money and offers rare insight into solutions that can work to bring prosperity back to America. Additionally, we are offering the most prolific supporters a free one-year subscription to Karl Denninger's Ticker Forum Gold Membership service, a $150 value and a service that is priceless for those who wish to garner insight and understand our markets and our economy. These awards will go to the first four Swarm members who bring us an additional 15 registered Swarm members. Of course funds are needed to grow the organization and to garner political support. Therefore everyone who donates to the American Party PAC will receive a quantity of beautiful two-sided SwarmUSA business cards for distribution. If you would like more information about this topic, or to schedule an interview, please contact Mr. Jim May – media@SwarmUSA.com. FREEDOM'S VISION - SECURING OUR MONEY, OUR FREEDOM, OUR FUTURE! Funding and volunteer support provided by The American Party PAC. 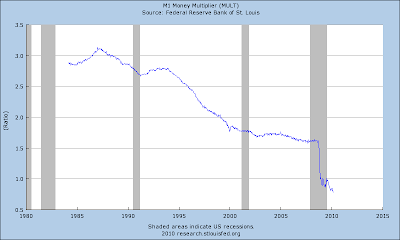 Below is the latest edition of Monetary Trends from the St. Louis Fed. You’ll note that most credit numbers are still contracting, inflation numbers are turning up, and money aggregates are decelerating their growth rates. Before you dive into the report, there are a couple of charts I want to highlight. The first one is the S&P 500 trailing Price to Earnings ratio. It had spiked to all time record highs near 150! We knew that the 4th quarter earnings would result in this coming down, and now this chart reflects those numbers, coming in with a trailing P/E of “only” 90! What a bargain, get ‘em while they’re hot! Meanwhile the jokesters on Wall Street and in the media create flashy brochures disguised as economic and market reports. They talk about “future earnings” as if they have ever been able to correctly divine the future, and they talk about “operating” earnings that conveniently ignore “one time” and “special” expense items that seem to occur far more frequently, as in every single reporting season. Those economic and market marketing brochures are also built upon what would be considered in any rational world plain old accounting fraud, with mark-to-model and off balance sheet items galore. The point? The only P/E that matters is the one currently produced, the rest is all bull. The current P/E of 90 is roughly 5 to 6 TIMES higher than modern historic norms and is still far above the bubble heights of the tech bubble. And our government keeps pouring the debt backed money into the system. Since current incomes cannot support current debts, as that debt money is funneled into the system, the vast majority of it simply is used to service already existing debt. Thus it is manufactured, but simply circles right back around to the bank who continually skims interest and fees as the money goes around and around in a circle, never creating a path through productive hands in the economy. The Headline numbers on the Unemployment Situation Report are: The rate remained the same at 9.7%, the consensus was 9.8%. The number of jobs reportedly lost in February was 36,000, the consensus was for -50K. Note in the chart above that we ran right into the upper boundary of a potential megaphone and now prices are pulling back somewhat. The dollar is higher, bonds are lower, both oil and gold are higher. Severe weather in February did not have as much impact on jobs numbers as feared. But government layoffs are now weighing on the numbers. Nonfarm payroll employment in February declined 36,000, following a revised 26,000 decrease in January and revised fall of 109,000 for December. The February payroll decline was less negative than the market forecast for a 50,000 fall in employment. The January and December revisions were up a net 35,000. Weakness in February was led by a 64,000 drop in construction jobs. 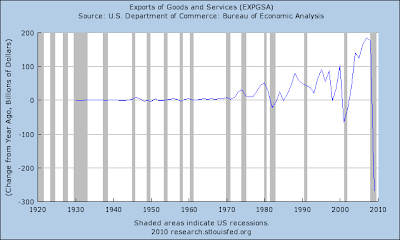 Rounding out the goods-producing sector, manufacturing actually edged up 1,000 and mining rose 4,000. Service-providing jobs were up 42,000 in February, following a 20,000 increase the month before. The highlight was temp help being up 48,000 in the latest month. Government jobs fell 18,000 despite the hiring of 15,000 temporary Census workers. At the federal level, the U.S. Postal Service cut 9,000 jobs. Local governments shrank their work forces by 31,000 in the latest month. From the household survey, the unemployment rate held steady at 9.7 percent in February. Wage inflation in February eased to a 0.1 percent rise from 0.2 percent the month before. The consensus had expected a 0.2 percent gain. The average workweek (traditional series) slipped to 33.1 hours in February from 33.3 the month before. It's hard to really determine the direction of momentum this month given the heavy snow storms. Equities traders, however, see the numbers as positive and futures are up. Once again we see revisions sending the prior numbers even higher. There are notes in the report regarding weather and how they count people laid off by it, basically they don’t. Within the report you will find that construction and other private sector jobs are still hemorrhaging while government is one of the few sectors growing. The number of persons working part time for economic reasons (sometimes referred to as involuntary part-time workers) increased from 8.3 to 8.8 million in February, partially offsetting a large decrease in the prior month. These individuals were working part time because their hours had been cut back or because they were unable to find a full-time job. About 2.5 million persons were marginally attached to the labor force in February, an increase of 476,000 from a year earlier. (The data are not seasonally adjusted.) These individuals were not in the labor force, wanted and were available for work, and had looked for a job sometime in the prior 12 months. They were not counted as unemployed because they had not searched for work in the 4 weeks preceding the survey. Among the marginally attached, there were 1.2 million discouraged workers in February, up by 473,000 from a year earlier. 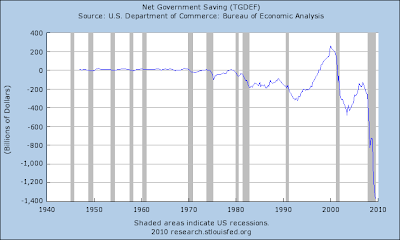 Note that the numbers are up considerably from the height of the financial freeze-up one year prior to these numbers. Below is the alternative measurement table. U6 is the number most closely comparable to how unemployment used to be calculated for those looking to compare this timeframe to earlier in the 20th century. 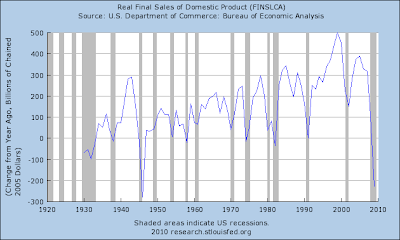 Note that not seasonally adjusted U6 fell from 18% to 17.9%, but that seasonally adjusted U6 rose from 16.5% to 16.8%. These numbers are depression era numbers. It may not feel like that to you, but to those unemployed I’m sure it feels a lot more depressing, and were it not for massive “safety nets” created by borrowing money we don’t possess, those people would literally be standing in soup lines. 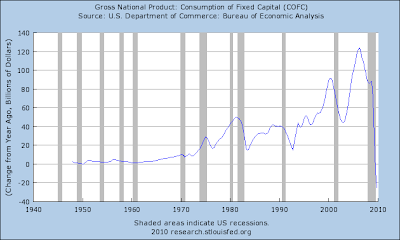 Consumer Credit numbers come out at 3:00 Eastern. There was a small movement on the McClelland Oscillator yesterday meaning a large price move today was likely. Prices have pulled back a little from the upper boundary of the megaphone. We’ll have to watch prices to see if we return back to the bottom or break out. I still think this appears like topping action. Keep in mind that what seems like it's taking an eternity to play out will in hindsight appear to have happened very quickly. Remember that today is Friday, so will we get the usual front-running of the coming Monday ramp job on top of the employment front-running and ramp job? What a joke, valuations still way above historic norms, future P/E’s based on pure fantasy. The dollar is up slightly, bonds are down, while both oil and gold are down just a little. Jobless claims swung lower, down 29,000 to 469,000 vs. expectations for 475,000. There are no special factors in the Feb. 27 week. The prior week, when heavy weather increased filings, was revised 2,000 higher to 498,000. The weekly data for February show steep swings whether up or down. The four-week average, which helps smooth out volatility, fell 3,500 in the week to 470,750, a level showing no significant change from late January to indicate no improvement for tomorrow's non-farm payroll headline which is expected to fall 50,000. Markets showed no reaction to this morning's report. Continuing claims fell 134,000 to 4.500 million in data for the Feb. 20 week. The drop marks a significant move lower for the data, pointing to an uncertain mix of hiring and benefit-expiration. The unemployment rate for insured workers slipped 1 tenth to 3.5 percent. States reported 5,687,574 persons claiming EUC (Emergency Unemployment Compensation) benefits for the week ending Feb. 13, an increase of 207,632 from the prior week. There were 1,929,723 claimants in the comparable week in 2009. EUC weekly claims include first, second, third, and fourth tier activity. Emergency claims are nearly 3 times as many as the year prior and for the WEEK rose by 207,000. How many of the current claimants will be doing the same in 6 months? We’ll see. Both productivity and costs were revised better than expected for the fourth quarter. Businesses clearly are focusing on cutting labor costs to try to boost profits or cut losses. Nonfarm business productivity was revised up to a sharp 6.9 percent boost from the initial estimate of 6.2 percent. This followed a revised 7.8 percent surge in the third quarter. Today's report includes annual revisions which raised the Q3 figure. The consensus had called for a 6.3 percent revised gain for the latest period. Unit labor costs fell an annualized 5.9 percent in the fourth quarter, compared to an initial estimate of minus 4.4 percent and a revised third quarter plunge of 7.6 percent. 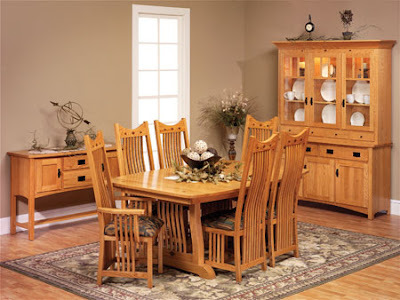 The market forecast was for a 4.5 percent drop in costs. The fourth quarter jump in productivity reflected a 7.6 percent spike in output, following a 2.2 percent gain the prior quarter. Hours worked edged up a mere 0.6 percent after a 5.3 percent annualized drop in the third quarter. Compensation cost inflation is nearly nonexistent as compensation rose only 0.6 percent, following a 0.4 annualized percent dip in the third quarter. Year-on-year, productivity rose to 5.8 percent in the fourth quarter from 4.6 percent in the third quarter. Year-ago unit labor costs fell to minus 4.7 percent from down 2.7 percent the previous quarter. Today's productivity and cost numbers are good for businesses trying to get back to a healthy cost position. But it also indicates that businesses are still slow to hire. Here’s the deal. The productivity numbers are inflated for the same reasons that GDP is inflated, the output is measured in dollars with all the false accounting and statistics rippling through the reports. What people have yet to figure out is that the very same people who represent “labor costs” when out of work or when taking pay cuts have less to spend into the economy. This is the opposite of a virtuous cycle, it is like choking yourself and saying that it’s a good thing. Yes, increases in productivity are good, but like all things there has to be balance. When I see growth numbers in the 7% range, I immediately know that we are talking about paper increases and that the odds of those increases being real are very low. If they were real, they would be very unsustainable. 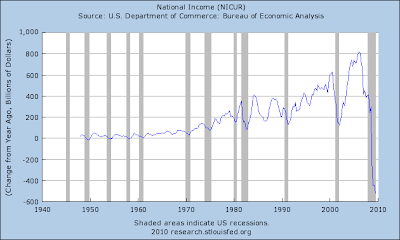 Deflating labor costs at that rate should scare the heck out of the markets and out of the Fed. Creating the sustainable inflation they seek with falling wages is simply not possible. In the markets, there is a potential megaphone top forming in the futures. If that is occurring we should see a new higher high today that follows last night’s lower low. That same pattern is not as clear, however, in the day only market indices, I see more of a potential Head & Shoulders pattern forming with the neckline on the DOW at about 10,400, or about 1,117 on the SPX. 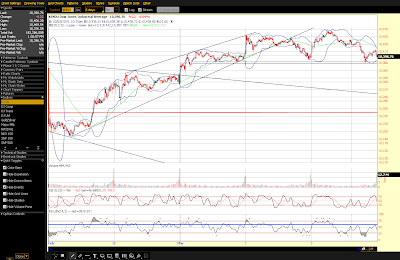 If that is occurring, then we should not make a new high today. Both of these patterns are potential topping patterns, indicating that a couple more days time will likely be required to break the current range. Obviously, that could happen tomorrow on the very important monthly jobs report. I’ll try to keep both patterns updated in the daily thread below. Hat tip to JH for providing the following links. Both the dollar and bonds are down, oil and gold are higher with gold looking like it’s broken out. Overall domestic sales of light vehicles was down in January, coming in at 7.6 million, the consensus was 7.9 million and that was also the amount sold in December. The insane and worse than worthless MBA Purchase Applications report came up off last week’s record low reading. Of course we don’t know exactly what that reading was or what it means, or really anything else about it, because all the MBA will report is percentage change of an index that they made up and change at their will, but people seem to be okay with that? Fools. A drop in rates fed a burst in mortgage applications during the Feb. 26 week. The gain was centered in refinancing applications which rose 17.2 percent. Purchase applications rose 9.0 percent but the Mortgage Bankers Association, which compiles the data, describes purchase activity as "subdued" and still in the narrow range of the last few months. The average 30-year mortgage dropped 8 basis points to 4.95 percent with 15-year mortgages down 8 basis points to 4.27 percent. Pending home sales, which have been very weak, will be posted tomorrow at 10:00 ET. Note that it was NOT applications that rose, it was their index… 17.2% in a week? Riiiiggght… but that seems to the norm for these loons. In a positive indication for Friday's jobs report, Challenger's count of layoff announcements fell to 42,090 in February for the lowest total since the economic strength of mid-2006. For comparison, the layoff count in January was 71,482 and was a chilling 186,350 in February last year. Layoffs in construction, a sector believed to have been hit hardest by the month's heavy weather, were minimal. The report believes employers have now shifted away from downsizing. NEW YORK (CNNMoney.com) -- The U.S. Postal Service said on Tuesday that it would reduce its workforce by another 30,000 positions and slash overtime this year in an effort to reduce costs. Together these staffing reductions will result in cost savings equivalent to eliminating 50,000 full-time positions, according to Chief Financial Officer Joseph Corbett. Like getting your weekend Netflix on Saturday? Not any longer. ADP is calling for a 20,000 decline in February private payrolls. The report said weather had only a minimal impact on its results but warns that weather is nevertheless likely to have an effect on the government's results. Equities firmed slightly in reaction to the report. So we get to ignore Larry Summer’s ignore? I’m pretty sure I already had. "You have made your point ... [but] the majority of the Senate disagrees with you," Reid told Bunning. The need to extend unemployment benefits is "an emergency. ... Our economy is suffering. [There are] long lines of people out of work." Reid called Bunning's legislative maneuvering "terribly inappropriate." Maine GOP Sen. Susan Collins sided with the Democratic leader, saying Bunning's views "do not represent the majority of the Republican caucus." Anyone remember the quote about people calling for their own monetary destruction? Seems like that’s ringing a bell somewhere, just saying – it’s a math thing, and yes, this is “only” 10 million dollars to last until April 5th, no biggie, just put it on the tab and we’ll keep many thousands from standing up for themselves and for their country. “Wild Man” Richard Fisher is calling for a breakup of the big banks – gaaasp! Now that’s just heresy. March 3 (Bloomberg) -- Federal Reserve Bank of Dallas President Richard Fisher called for an international pact to break up banks whose collapse would threaten the financial system, a position that goes beyond other Fed officials. “The disagreeable but sound thing to do” for firms regarded as “too big to fail” would be to “dismantle them over time into institutions that can be prudently managed and regulated across borders,” Fisher said in a speech at the Council on Foreign Relations in New York. Now there’s a man of the people, a future President right there. 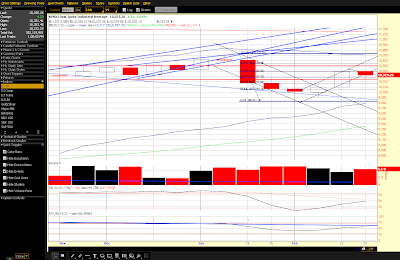 Turning to the markets, they are extremely overbought on the short term timeframes. The Trin has gone out at extreme levels the past two days, the put/call ration is way low especially on the NDX, and new 52 week highs have jumped back up to 360 with 0 new lows – all extreme readings. The RUT did go on to make a new high yesterday, here's what McHugh thinks about that from his perspective, "If prices exceed the January 19th top in all major indices, it means Supercycle degree wave (B) from last March has further to go on the upside before completion. If one or two major averages exceed the January top, but several others fail to confirm, that would be very bearish for the stock market in general." Guess we're going to find out. McHugh also has a wave count that says yesterday’s action may have been a wave 4 and that there is a wave 5 up coming, but he once again thinks this should be the final wave prior to a correction beginning. We’ll see, we’ve been here before. Again, this market is similar to the way markets topped in ’07, but it did take most of the year to play out. I don’t think this will take too much longer, we’re way over extended here and have already fallen away from that giant rising wedge. 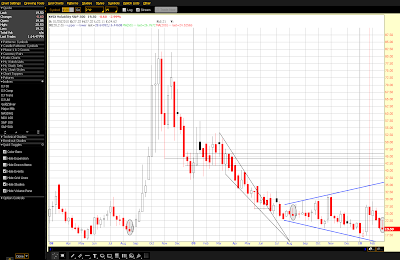 Patience is a virtue, for sure, there are larger trendlines in play, I think it’s most wise to wait for them to break. These “casual” swarms we’ve started in the daily thread have been quite successful! With just a few of us making posts, we managed to double the traffic to the Swarm site the first day, and then we doubled it again the next, actually by vBulletin’s count we quadrupled it! And we’re picking up new registrants as well. Let’s keep that up, we’re planning on a Grand Opening Swarm for this Saturday, March 6th! 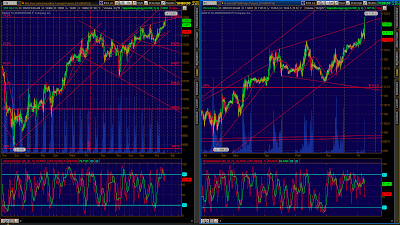 On both those charts you can see a rising wedge with an overthrow out of the top which is typical of rising wedges. The only problem with these wedges is that while they are clear in the futures, the wedge is not so clear in the indices themselves without the overnight trading, and thus my confidence in those being terminal patterns, as they normally are, is lower. Both the dollar and bonds are lower, oil and gold are both higher. The only economic data of the day are the silly Redbook and the Goldman ICSC. The ICSC was down .8% week over week, but up .7% yoy. 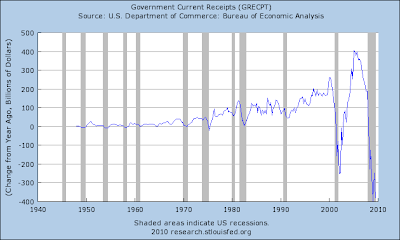 Redbook is up 1.4% yoy, both are totally false readings as they do not account for store closings. 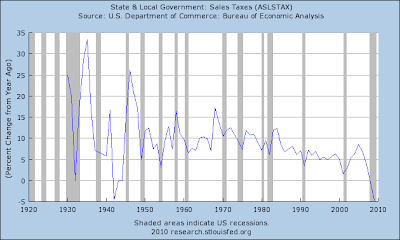 This is why we turn to sales tax data which for state and local governments nationwide is now down about 5% year over year, even lower than the very bottom of the panic occurring one year ago. First Greece is going to be bailed out, that’s cause for markets going higher. Now they say that within just a few days they will announce measures to help get their fiscal imbalance back under control. Yeah, right! When your money is backed by debt, you can spend more and go deeper in debt, or you can cut back and watch as your economy contracts. Darned if you do, darned if you don’t. Neither a bailout or austerity measures are the answer, yet those are the only options being considered. The European Union needs a dose of Freedom’s Vision, and they need it soon. The problem for Greece and individual EU countries is that they are now tied to the Euro which means that they are at the mercy of the central bankers who managed to place themselves in power. Their power is much more thorough and complete than the elected officials, they tell the elected officials what they are going to do and how they are going to behave. Same in the U.S.. We let our central bankers steal that power from us in 1913 when the Federal Reserve Act was passed without a full Congress in session. At any rate, the Euro is up on the non-news and just like yesterday and last week there is really no fundamental reason whatsoever for equity markets to be higher. But they are, and the Russell 2000 is even nearing its prior high, the Transports are not that far behind (that’s a good one as they are being led by the airlines), and now the S&P and Industrials are both well over their 61.8% retrace levels. So, if we don’t turn down here, it seems likely that we get the RUT and maybe even the NDX onto new highs. 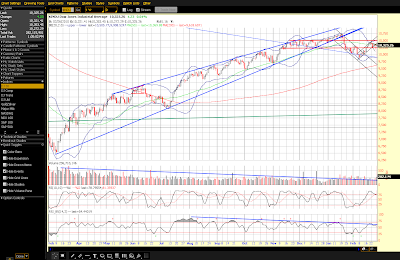 There are a lot of similarities between the action today and the action near the ’07 top. Then, as now, we had a large rising wedge that broke lower, and then prices crawled along the bottom boundary and even went onto new highs. 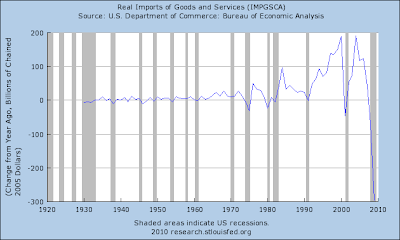 Then, as now, there was the rotational trade game being played, remember? One week tech stocks were hot, then they would fade and commodities were hot, etc. The same thing today – Amazon and Apple are ramping for no apparent reason other than there’s hot money chasing return. These are symptoms of a financial system out of control, and they are symptoms of topping action. The VIX has fallen below last week’s low and has pretty much invalidated that inverted weekly hammer – but the week’s not over, so we’ll have to see what the weekly candle looks like. 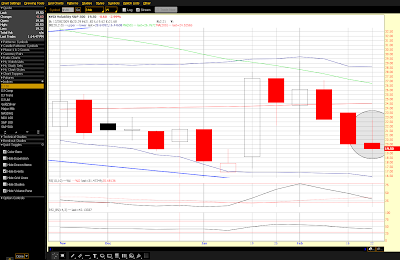 It needs to turn around now or else it was not a meaningful candle. The Supreme Court has decided to review a Second Amendment case regarding the Constitutionality of gun control limits as there is now in Chicago. That will be interesting. The Emergency Unemployment extension is held up still, that too is going to be interesting. I’m sure the Central Bankers actually support printing more money to placate the masses, why not, it’s just more debt from which they profit. Kiss Saturday mail delivery goodbye, can’t afford it, yet amazingly we can afford $400 Billion PLUS in interest payments to the central bankers and literally Trillions more to buy down interest rates. Hey, buy stocks, your future depends upon it, LOL! No, I haven't turned into a Cramer like shill, it's just another bad joke, but I'll keep pushin 'till it's understood! There's trouble in the heartland, got a head-on collision, smashin in my guts man... Poor men wanna be rich, rich men wanna be kings, and a king ain't satisfied till he rules everything. Today The Nation published an article titled, The Media-Lobbying Complex which is a terrific tale of corporate lobbyists who get themselves on television and don’t reveal their connection or the fact that they are paid by lobbying groups. Since 2007, at least 75 registered lobbyists, public relations representatives and corporate officials have appeared on cable news broadcasts "with no disclosure of the corporate interests that paid them," The Nation magazine (March 1) reveals. Many of these people are "paid by companies and trade groups to manage their public image and promote their financial and political interests," writes the magazine's Sebastian Jones, a freelance reporter after a four-month-long probe. "Many have been regulars on more than one of the cable networks, turning in dozens---and in some cases hundreds---of appearances," Jones reports. For example, Tom Ridge, identified as the former governor of Pennsylvania, appeared on MSNBC's Hardball With Chris Matthews urging the White House to "create nuclear power plants." What viewers were not told, though, is that Ridge since 2005 has pocketed $530,659 in executive compensation for serving on the board of Exelon, the nation's biggest nuclear power company, Jones writes. On the same day, last Dec. 4th, retired general Barry McCaffrey, told MSNBC viewers the war in Afghanistan would require a three-to-ten-year effort and "a lot of money." Unmentioned, Jones says, was the fact DynCorp paid McCaffrey $182,309 in 2009 alone and that DynCorp has a five-year, $5.9 billion deal to aid U.S. forces in Afghanistan. Jones describes MSNBC as "the cable network with the most egregious instances of airing guests with conflicts of interest." He notes, "Only on MSNBC was a prime-time program, Countdown, hosted by public relations operative Richard Wolffe and later by a pharmaceutical company consultant, former Governor Howard Dean, with no mention of the outside work either man was engaged in. And MSNBC has yet to introduce DynCorp's Barry McCaffrey as anything but a 'military analyst.'" Moreover, last January 22nd, MSNBC's Morning Joe audience saw Mark Penn, identified only as a Clinton administration pollster, suggest the Obama administration put healthcare reform on ice. Unmentioned, says Jones, was "Penn's role as worldwide CEO of Burson-Marsteller, which has an entire healthcare division devoted to helping clients like Eli Lilly and Pfizer 'create and manage perceptions that deliver positive business results.'" Jones reports that what transpires on MSNBC also occurs on Fox News, Fox Business Network, CNN and CNBC. These outlets "eager to fill time and afraid of upsetting the political elite, have often looked the other way (and)at times...have even disregrded their own written ethics guidelines." MSNBC may be the most flagrant example of deception but the other networks do not appear far behind. During a Sept. 18, 2008, Fox News appearance to discuss Sarah Palin, Bernard Whitman, president of Whitman Insight Strategies---whose clients include marketing/PR firms like Ogilvy & Mather---lambasted Sen. John McCain for proposing to "Let AIG fail," saying his position demonstrated "just how little he understands the global economy today." Whitman's "ongoing work" for AIG was not mentioned! "When there's a whole host of pundits on the airwaves touting the same agenda at the same time, you get a cumulative effect that shapes public opinion toward their agenda," Janine Wedel, an anthropologist at George Mason University told Jones. Another academic, Jay Rosen, journalism professor at New York University, said, "More disclosure is good---I'm certainly in favor of that---but why are these people on at all?" That's a very good question. MSNBC, Fox, and the others guilty of deceptive journalism owe their viewers an apology. Such broadcasts are neither fair nor balanced. They are deceptive, slanted, and contrary to the public interest. The cable broadcasters need to pledge to their viewers to reveal the hidden corporate agendas of their guests. Until that time, viewers can always turn them off. This type of thing is just counter to the best interests of our country. No one is there to police it anymore because so many have been co-opted. The provisions within Freedom’s Vision Political Reform would take care of most this. Please support Freedom’s Vision by registering for the Swarm! 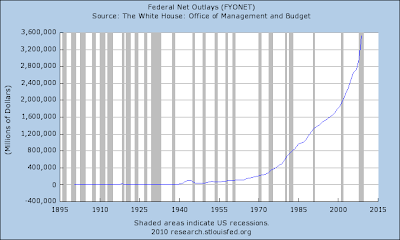 Many people get all wrapped around the axle about debt to GDP statistics. This is a complete Red Herring as comparing our Federal Government’s debt to the productivity of the nation is exactly the same as comparing your personal debt to the productivity of your neighborhood. They are unrelated. 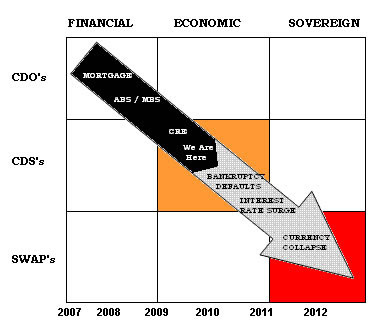 Historic collapse, take a look at the magnitude of the collapse and how far back those charts go in time. You can talk up the “recovery” all you want, you can call it a “recession” all you want, but lip service does not change what is occurring on those charts and to our debt saturated economy. We let the Central Bankers take over our money supply and we let them back all our money with debt at their benefit and at our expense. It is time to change that equation around! Please support Freedom’s Vision by registering for the Swarm, and bee sure to tell your friends. Do it for your country and do it for future generations. Equity futures are mostly flat to slightly higher for your central planned Monday ramp job. The roller coaster will be departing momentarily, please ensure that your life’s savings are securely fastened, and please note that an air sickness bag has been provided for your convenience and for the comfort of those seated next to you. Have a good trip. 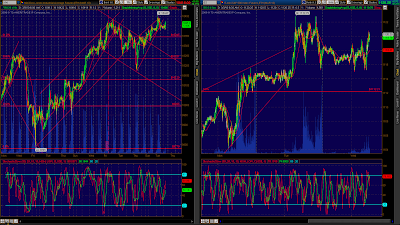 The dollar, meantime, has gone for a vertical rocket-shot, and bonds are rising. 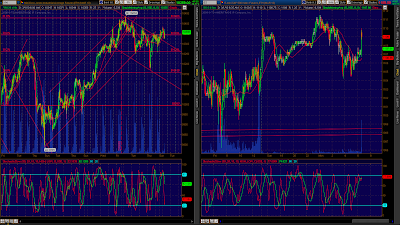 I would like to point out that last week was quite unusual as both bonds and stocks were up. When this condition occurs, it is usually the bond market that is correct – watch this relationship, I’ll bet there is some catch up coming shortly. The Euro is down hard this morning. Oil is up slightly and gold is down slightly. Wages & salaries were strong in January, up 0.4 percent but were not strong enough to offset a reversal in last month's jump in farm income to make for a lower-than-expected 0.1 percent increase in personal income. The spending side is also mixed. A 0.5 percent rise for personal consumption is stronger than expected but, given a 1.8 percent surge in non-durable goods, looks to have been boosted by gasoline. Spending on durable goods rose only 0.1 percent with spending on services up a moderate 0.2 percent. Price readings are flat with core PCE up only 1.4 percent year-on-year, while the savings rate, drawn down by spending, fell 9 tenths to 3.3 percent. Equities got a slight lift on today's report, one highlighted by strong wages. The Manufacturing ISM and Construction Spending come out at 10 Eastern. The largest economic report of the week is the February Employment situation that is released on Friday. Speaking of unemployment, did everyone see that the emergency unemployment benefits failed to get extended and that as of today there are now 1.2 million people who instantly fell off the unemployment rolls? They can still vote to reinstate them, but as of now those people are losing the only income they have. Today is a Bradley Model turn date and it is at the backside of the window of McHugh’s turn dates as well. Friday’s action produced yet another small change in the McClelland Oscillator, this is another phenomena that is occurring at a high rate and I believe it’s related to the Monday ramp job. Prices try to move lower on Friday, but the market is supported and late day buyers come in trying to get in front of Monday’s ramp. That back and forth movement produces the small readings. 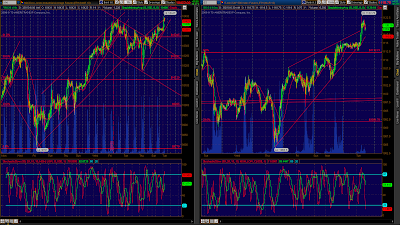 Now we can expect today or tomorrow to be a large directional move. I want to go over a few charts today as I didn’t get a chance to go over them for the weekend – I see some things of interest mainly in the weekly charts. 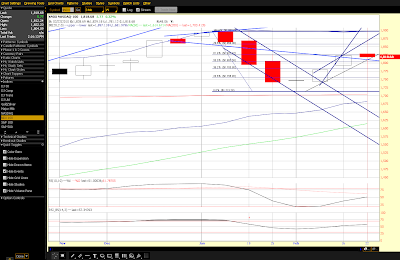 In general, the markets are back to being overbought on the daily time frame – we left Friday with the short term oscillators in the middle of their ranges. McHugh has some short term patterns that say we have one more wave higher, likely at the beginning of the week, then we move lower. This looks reasonable, but we need to see lower on the week to validate the hammers. 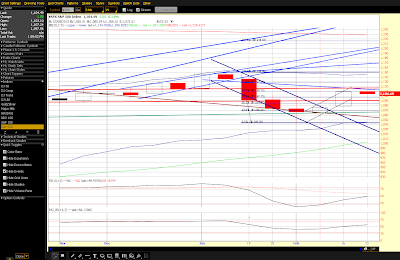 There is something brewing in Europe with our dollar rocketing higher and the Euro falling. There is also something brewing with bonds disconnected from equities – the bond market players are smarter than the equity players. 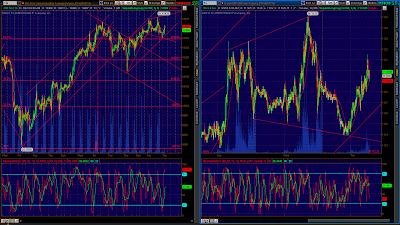 Bonds bounced perfectly off long term support. Money cannot continue to flow both into bonds and equities for very long – one or the other will give. Below is a link to a CNN article on DEBT. This is a perfect example of where Swarm members and supporters of Freedom’s Vision can make a difference by going and placing information about the fact that there is a solution that can work as I did this morning. Please take the time to make a remark and place a link to www.SwarmUSA.com in the remarks, thank you!